Before you get all teary-eyed about the closing of Restaurant Skadi, pop a bottle of your favorite bubbly and raise your glass — this is a story worth celebrating. Restaurant Skadi opened its doors for business on Dec. 21, 1995. It was the winter solstice, and the beginning of a dream. It is the restaurant many locals consider the best in town and when Skadi closes on Saturday, May 26, it will have been open for a celebrated 16 1/2 years. What sets Skadi apart from other restaurants is the man in the kitchen. Wearing a proverbial toque and clad in crisp chef whites, Chef Ian Algerøen leads the culinary team from his post at the sauté station. He’s diligent and methodical in his work and passionate about theater of dining. At 5 p.m. Chef Ian gathers the staff for a champagne toast. This isn’t a ritual that happens every night at Skadi, but a good one that happens from time to time. Named for the Viking Goddess of Skiing and Hunting, Skadi draws its inspiration from the mountains that surround it. The Scandinavian and Alpine influenced cuisine lures food-savvy locals and in-the-know tourists just about every night of the week. The food is a substantial part of the restaurant’s appeal. An old Chair 9 hangs in the foyer at Skadi, while the Norse God Ullr welcomes guests inside. The second floor Old Mammoth location’s panoramic views, intimate 60-seat dining room, ski memorabilia, and mellow vibe create an unparalleled locale for fine food and wine. There isn’t a better dinner table in Mammoth. Each plate at Skadi is delicately assembled with fresh seasonal ingredients. And many of those ingredients come from the Walking Beam Ranch in Santa Paula where Rancher Peter Busch, Chef Ian’s former business partner and lifelong friend, oversees the daily operations. The ranch exclusively supplies Skadi with venison, macadamia nuts, avocado, citrus, and herbs. Inspired by the success of deer farming in New Zealand, Busch’s parents, decided to farm venison. The family has owned and operated the Walking Beam Ranch since 1978. Menu highlights include a Walking Beam Ranch venison sausage served on fresh corn pancakes, savory mushroom crepes, salmon gravlax and a duck leg confit served with spätzli and lingonberries. There’s even a kids menu, a vegetarian menu and a very popular Sunday night burger menu. The success of the restaurant is a direct result of Chef Ian’s passion and dedication to the culinary arts. He began his career at the age of 13, working as a cook and bus person at the Big Green House, “Chicken, Steak and Chocolate Cake—all you can eat,” in Ventura. He went on to study at the California Culinary Academy (CCA), receiving a Professional Chef diploma in 1984. Algerøen has worked as a pastry cook during the game season in Switzerland as Chef Tournant at the Hotel Biberenbad and Chef De Cuisine of the Blue Fox in San Francisco. And he was the Executive Sous Chef at the CCA from 1989-1993. 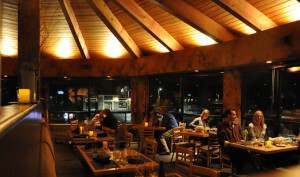 Eventually Algerøen settled in Mammoth and he was hired as Chef De Cuisine at Nevados (formerly Roget’s). After two years working for Tim Dawson at Nevados, Ian and Pete opened Restaurant Skadi. There have been many intelligent hard working individuals to pass through the back door at Skadi. If one wanted to be a successful Skadi employee he/she only needed to follow two rules: 1. The Chef is always right, and 2. Please refer to rule number one. After working at Skadi for a short time, one would quickly learn that the Chef actually is crazy. Seriously. It even said so on the menu. A quick phone call to let Chef know that I was going to be late for work (because I was about to drop into epic powder on the Sherwins) was not reprimanded. Rather, Ian ran to the office to grab a pair of binoculars so he could watch. The Skadi ski tune room was open to current and former employees and a few select friends. There were many late night tuning sessions where limited bottles from Chef’s private cellar were consumed while the snow accumulated outside. Chef quizzed his employees about the best rock and roll band to ever live (Led Zeppelin) and taught the staff about cuts of meat by demonstrating on his own body. He cooked lobster and eggs for the cleaning parties and taught us that that the Caesar salad was invented by an Italian chef in Tijuana. At Skadi we did not drink—we tasted because it was part of our education. But all good things must come to end. The closing of Skadi is bittersweet for me. I moved on five years ago to eventually become the Wine Director at the Westin Monache Resort. Now that Chef Ian is moving up the hill to take the Executive Chef position at the Westin, once again, I get to work with the chef that taught me everything I know about food and inspired me to learn about wine, but the restaurant where I feel most at home is closing. And I’m not the only one who’s sad. For the final week of business the restaurant has been packed with locals enjoying a last supper. 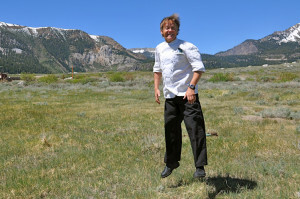 “The Eastern Sierra is losing one of its best, if not the best, restaurant in the region,” said John Rogitz, a loyal customer and good friend. “Skadi’s bill of fare fit well into anyone’s gastronomic preferences, and some of the best bottles of wine this side of Bordeaux were regularly uncorked there. Part of what made Skadi so successful was the quality of the guests and the intimate size of the dining room. Chef Ian made regular laps throughout dinner service. Longtime customers became friends and new customers were genuinely welcomed. On snowy nights as dinner service slowed down, Chef Ian would gear up and dig cars out of the snow. He never asked a server or a dishwasher to shovel; he did it himself. Chef Ian plans to bring some of the classic Skadi dishes with him to the Westin, but will most likely leave the snow shoveling and car service to the hotel’s valet team. He also wants to integrate Mexican and Japanese inspired dishes, drawing influence from the California culture in which he grew up, and there is a good possibility of a “Skadi Burger” making its way to the menu. With moving to a much larger restaurant Chef Ian will be managing a bigger culinary team and cooking three meals a day, but he wants to offer the same personal dining experience that his guests at Skadi came to know and love. Up the hill at the Westin, the current staff is buzzing with excitement and anticipation. For Ian and those close to the restaurant, it is an emotional beginning of another chapter.